New York: Deutsche Bank has presented its fourth “Artist of the Year” award to leading Pakistani contemporary artist Imran Qureshi. The selection was made on the recommendation of internationally renowned curators including Okwui Enwezor, Hou Hanru, Udo Kittelmann, and Victoria Noorthoorn, who comprise the Deutsche Bank Global Art Advisory Council. This award was instituted in 201o to honor an international contemporary artist who has already amassed an unmistakable and extraordinary oeuvre working with the paper medium or photography, the two focal points of the celebrated Deutsche Bank Art Collection. The Deutsche Bank Collection is one of the most comprehensive corporate art collections in the world, featuring over 55,000 photographs, prints and drawings worldwide. The Collection started with early acquisitions of significant German-speaking artists such as George Baselitz, Joseph Beuys and Sigmar Pölke. As the Bank has grew globally, so did the size and interactive nature of their art collection, which was directed to reflect today’s diverse contemporary art world and an international point of view. Hence works of German artists were juxtaposed with works by master artists from respective host countries. The bank’s art collection is strategically headquartered in New York City to take advantage the city’s vibrant contemporary art environment and the international profile of the people who work in and visit the bank daily. The award is not based on a financial reward, but positioned as an integral part of Deutsche Bank’s art program through its substantial collection, exhibitions, and its joint projects with partners. For the past three years, since its inception, the reward included a solo exhibition at the Deutsche Guggenheim in Berlin accompanied with a comprehensive catalogue, an exclusive edition designed by the artist and acquisition of the artist awardee’s select works on paper for the Deutsche Bank Collection. This year, the announcement coincided with another important disclosure by the Bank. On Monday, November 12th, 2012, the Deutsche Bank announced the space which currently holds the Deutsche Guggenheim in Berlin will be converted into the German capital’s newest kunsthalle in Spring 2013. This announcement was a follow up of the news that broke out early this year of the Guggenheim closing its Berlin premises at the end of 2012. This space will mark the end of the bank’s 15-year collaboration with the Solomon R. Guggenheim Foundation. In its press release, the bank declared that “the Kunsthalle is conceptualized as a place where young, promising talent can be seen first. 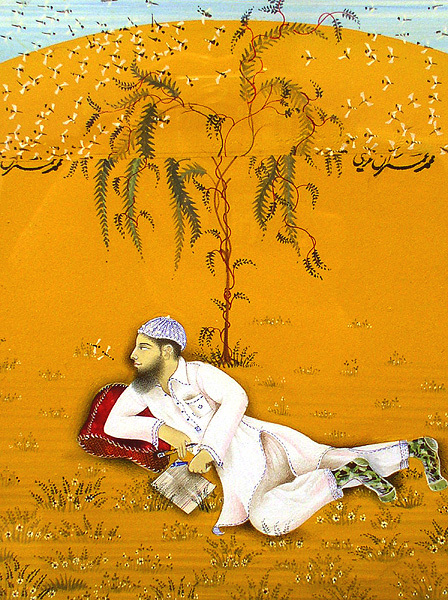 Its inaugural exhibition in April 2013 will feature the work of Imran Qureshi, one of the most important figures on Pakistan’s art scene today.” Read more. To learn more about Imran Qureshi, click here. It’s going to be ending of mine day, except before end I am reading this impressive piece of writing to increase my experience.